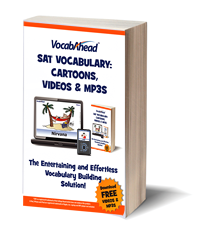 As the book claims, this program truly is “the entertaining and effortless vocabulary building solution.” I was asked to review the hard-copy book of SAT Vocabulary: Cartoons, Videos & MP3s. By purchasing the book, you also purchase permission to download the accompanying videos and mp3s. The book contains 300 words that are divided into 30 units. Each word is defined, illustrated with a cartoon, and used in a sample script to aid in understanding through context. The cartoon illustration creates a visual connection with the word for the student. The creators attempted to tie emotion into the illustrations so that there would also be an emotional connection with the word. These techniques make recall easier and certainly more pleasant. In addition to the book, the videos and mp3s add a significant level of reinforcement. It’s been proven that people increase their retention of new material when that material is presented in a variety of ways involving a variety of senses. Students are encouraged to concentrate on one unit per week. Each unit consists of ten words and a review. We would read each of the words and look at the cartoon illustration. We read the sample script, the part of speech, the antonyms and the synonyms for each word. Then we would add the videos and mp3s for the unit of the week to my daughter’s iTouch for her review. Once she felt confident that she had mastered the words, we moved onto the review. We kept a list of words that needed additional review. The book was easy to use. Even if you don’t have an iPod or iTouch or iAnything, you can still watch the words in action on your computer. Having an iSomething makes it more portable, but that’s about it. You can add the mp3s to any mp3 player – or just listen with software on your computer. It’s nice that the kids can be completely independent with this program – no mom input required. No teacher preparation required. Just pick a unit and go! VocabAhead is available for purchase directly from Amazon. The book is priced at $12.95. VocabAhead also produces a DVD-Rom version with over 1000 words. You may purchase that from Amazon as well; it’s price is $24.99. For those who do have an iTouch, VocabAhead makes an app that may be downloaded through the iTunes store. Take a look at the website – they have a section where students can upload their own video and illustration creations for the words. What fun! What age group do you think this is made for? I’m thinking this sounds like a good option for Alex with the visual and the mp3 options. Renea – it’s meant for slightly older students than Alex, but I don’t see why you couldn’t use it with him – all the visuals and nmemonics would be terrific for him! Next time we are together, I can bring along the book. Be sure to look at their site for samples.